There are many Non-Eritrean Centers which have been the motivational and/or training centers of radical Brotherhood initiations with a mission that target Eritrea. Through these brotherhoods, they have maintained their impact to control Eritrea and Eritrean mindse by putting Eritrea’s sovereignity at jeopardy. For the last 200 year, the three most important and influencial centers that have played greater role in the creation of Eritrea as a colonized state of Italy were Axum, Kassala and Addis Ababa. 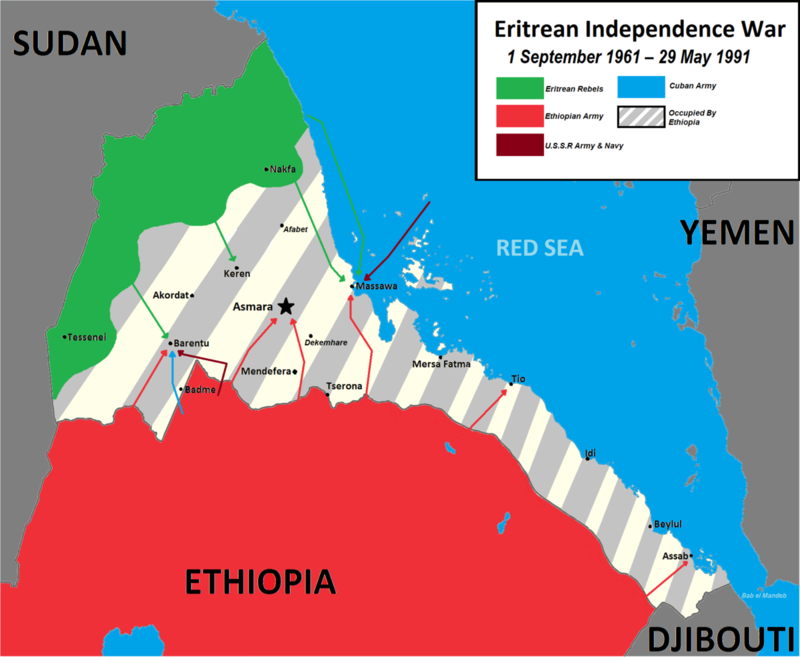 After the defeat of Italians, the same centers played greater role by meddling in the Eritrean popitical and armed struggle for independence. These centers who played these meddling activities were located outside Eritrea, mainly in Sudan and Ethiopia. There were also other centers located in Egypt, Somal, Italy, Sweden, Israel, UK, USA, etc. But those which had greater impact were in Sudan and Ethiopia. These centers played crucial role by exercising their influencial power to put Eritrea within their atmosphere. These two centers are continuing to have their influence. Although there are several other centers who share greater influence, to some extent many of them seem to respect Eritrean territorial and political sovereignity while influencing social and cultural sovereignity of Eritreans through their established centers within Eritrean sovereignity. For example, the Roman Catholic of Vatican, the Coptic Orthodox Church of Alexandria (Egypt), al-Azhar University, Mecca and Protestant church from Sweden. Other minor centers, like Jehovah, Baha’i, Pentecostal Church have also presence in Eritrea. The three most influencial and politically active centers which have direct hegemony on Eritrean political, cultural and social sovereignity are important for studies. For example, Axum center has an influence on the Tigray-Tigrigni ideology(greater Tigray), Kassala has influence on the Eritrean Muslim community and relationship with Sudan(Eritrean Muslim League community), and Addis Ababa have influence on One Ethiopia(Unionist) ideology. As a liberal democrat, I do not appreciate those centers which interfer in Eritrean political sovereignity matters by influencing Eritrean political atmosphere, be it directly or indirectly. And, every Eritrean should be aware of the meddling of these religious centers to avoid unholy-mix between state and religion. Currently, a radical group from Eritrea and Ethiopia are working through the Agazian Brotherhood Association to promote and protect the values of Axum. Their agenda is to form a Greater Tigray state by uniting Tigray region with Eritrea, called Agazian State. Although there are many conspiracies on on who is behind this brotherhood there is no doubt that elites from Tigray and guardians of the holy temple of Axum could be major driving force and backbone for this movement. The Church of Saint Mary of Zion is historical. Its history dates back from the 19thC when Emperor Yohannes IV made his center in Axum during his reign as emperor of Ethiopia. The prostylizer of Emperor Yohannes IV’s kingdom was a Jew who was sent from UK as part of the Christian Zionism movement with an objective of creating a society that supports the creation of Israel for the Jews people by promoting the Biblical prophesy. Next to Saint George, the Church is now the second most important church in Ethiopian Orthodox Church. Therefore, guarding this temple is an interest of all Ethiopians and Christian community of the world. The case of Ethiopian Muslims in Axum is also another challenge this church has as it is not allowing Mosque to be built within the defined territory. The case of Muslims in Axum is am important case for many Muslim Eritreans who expand their political activism beyond the border. This mosque is run by al-Mirghani family who are followers of Sufi Islam. The al-Mirghani family are descendants of religious holy man who crossed the Red Sea from Hijaz Saudi Arabia to spread Islam. As part of Islamic missionary work, a Turkistan origin religious man called Mohammed Uthman al-Mirghani al-Khatim. In 1817, he was sent by Sheikh Ahmed ibn Idris as a prostylizer of Idrisiyyah Tariqa(another Sufi order). He did not establish the Tariqah well bit he left a child born from a Sudanese woman from Dongola(North Sudan). His child, al-Hassan, became the inheritor of bloodline descendants in Africa(al-Khatim). When Al-Hassan grew up, he became an influencial religious leader and established his center in Kassala by forming a separate Sufi Brotherhood order(Tariqah), called Khatmiyyah Order, with its distnictive characters which made it easily accepted by the locals. The first Eritreans who were influenced by Khatmiyyah are the Beni-Amir of Barka. From there, the al-Mirghani family expanded their acrivity to Sahel, Semhar and seenhit. From 1821 to 1850s, many Eritreans from Senhit and Sahel were attracted to Tariqah al-Khatmiyyah leaving the Ad-Sheikh holy family of Semhar from the Hanafi Mosque. After the death of Hassan al-Mirghani, his inheritor divided the Order into four regions, two of which are located inside Eritrea. One in Keren and the other in Massawa. The Eritrea branch expanded their activity in Eritrea by establishing religious centers and through representatives(Khalifs). During their Italian period, they were encouraged to expand their activity in the whole territory. By establishing their center in Keren(1903), they played a major role in the expansion of Italian influence and control. The symbiotic engagement of Italians and the al-Mirghani royal family led to greater political influence of to the Eritrean people. This gave a priveledged status Khatmiyyah Order to build their religious centers througout Eritrea. Although their importance declined for the last 50 years(since 1969), the al-Mirghani family remained the most influencial royal families among Eritreans. They have maintained important influence in political and cultural and religious affairs. Many are still giving their teibute to the family by visiting their house found in Keren and shrines of these holy family members. Since their establishement, their most importabt base has remained in Kassala with important branche centers that promote the same values and their activities. They are considered as the main link between Eritrean and Sudanese communities. These days, the Khatmiyyah brotherhood is actively expanding its activity inside Eritrea. Like what the Italians did. The al-Mirghani family are encouraged by the ruling regime in Asmara as a protectorate from other Islamic sects or school of thoughts considered as a threat to its rule, especially from Salafists and Wahabists. Since the al-Mirghani royal family are stationed in Kassala, it is hard to demarcate clearly how far they are from political influence that cpuld put Eritrean sovereignity at risk. Therefore, they are exploited by PFDJ as an indirect instrumenta for national security strategy. There are also thousands of Eritrean refugees in and around Kassala who were exiled from their native land during rhe 30 years war with Ethiopia. They do have resentment with the regime on the way they have been treated. Thereore, these Eritreans could be victims of al-Mirghani families. Therefore, they al-Mirghani family will have difficulty to break its relationship with the ruling regime in Asmara. This leads to meddling in Eritrean sovereignity. With the help of French and English prostylizers, Saint George Church was the last templar church built as the emperal house of the Ethiopian Empire. This was done as part of the restoration of the Christian kingdom of Ethiopia that had passed serious challenges during the conquest of Ottomans in the horn of Africa and to hult the expansion of Arab nationalism. Among the Christians, Saint George a well known Roman Soldier (4thC) sentenced for refusing to recant his Christian faith. He was venerated by “Crusaders” as a symbol of sainthood for his martyrdom. After the death of Yohannes IV, Menelik II of Shewa became the successor. He made his center in Addis Ababa and became the emperor of Ethiopia by incorporating Axum in his empire. King Haile Selassie continued his his center Addis Ababa by restructuring his Constitutional Order into the Emperor of Ethiopian Lion that functions under the Crown Council of Ethiopia. The guardians of the empire continued to have the title of Knight Templars, which is similar to knighthood templars. Although the Crown Council of Ethiopia has lost its power in 1974, the exiled Ethiopian Crown Council has continued to run its church by re-establishing itself in exile(USA). The Crown Council is now presided by King Haile Selassie’s son, Prince Ermias Haile Selassie. The Amhara elites and the Ethiopian Orthodox Church are promoting Ethiopianism, One Ethiopia, which is considered the political ideology of the Ethiopian emperors. The Ethiopian Crown Council and Ethiopian elites have not yet recognized Eritrean full sovreignity. At least, they are looking some sort of condederation or federation. The PFDJ regime has recently moved towards the “One Ethiopia” ideology under the pretext of “Peace Agreement”. For many, many of the political indicators which are giving signals resemble in line to the unity Ethiopianeness. For,example, Dictator Issaias Afewerqi has visited the cemetry of his grandfather found in Gonder, Ethiopia. By doing so, he witnessed his Ethiopianenesse by blood. Before, he gave a short but with a strong message saying, ” From now on warsds, anyone who considers Eritrean and Erhiopian people are TWO must be a naive”. This is a clear indicator where national sovreignity is put at jeopardy. Not only this, many Ethiopian elites are openly calling the unity of Ethiopia(including Eritrea). To the least, they are demanding Assab to be part of Ethiopia. To conclude, the above discussed Centers have little or no respect for Eritrean territorial unity and sovereignity. As a liberal democrat, Eritrean sovereignity is one of the nine most important principles. Therefore, it is my political mission to make sure that any force that puts Eritrean sovereignity at risk needs to be made legally accountable.